Postcard sent by Prosser Chaffey (fourth from left smoking pipe) to his sister Cis in 1909 when horse and carriage was still more common than motor vehicles. The Chaffey and Tye families have both featured in earlier articles. This article deals in detail with a particular branch of the local Chaffey family who called themselves Prosser Chaffey. Prosser is a surname originating in Tudor Wales but came to be adopted as a Christian name by the Chaffey family. The connection goes back to 1803 when James Chaffey married Martha Prosser at Montacute, Somerset. It was their grandson, also called James, who acquired the middle name of Prosser. They were all agricultural labourers, and via the women silk glove makers. It was this James Prosser Chaffey (1832 - 1886) who appears in Box in 1861 as a mason. He may have moved to the village about the time that he married Mary Ann Geard of Montacute as their first child, William James, was born in Box in 1860. James and Mary Ann appear to have acquired an interest in land at the top of Chapel Lane and built Charlotte Cottage. It was their second son, Harry Chaffey, that we follow in this article. Henry Prosser (Harry) Chaffey married Rose Wilkins and in 1901 they lived with his widowed mother at Bull's Lane, Box, where Rose was described as charwoman (house cleaner). Harry's eldest son, Montague Prosser (usually known as Prosser) was born there. Harry worked for the Bath and Portland Stone Firms Ltd and the whole family had strong connections with The Firms partly through Herbert Prosser Chaffey, Montague's uncle, who was the Manager of the Bath & Portland Stone Co. The brothers, Arthur and Harry, remained in close contact because they worked on many of the same stone projects. Above: Montague Prosser Chaffey seen in 1907 (left) and 1913 (right). Stonemasonry was the obvious career for Prosser and he was apprenticed, probably to his uncle Arthur, when Harry and his family moved to the Devizes Road a few doors up from Charlotte Cottage. 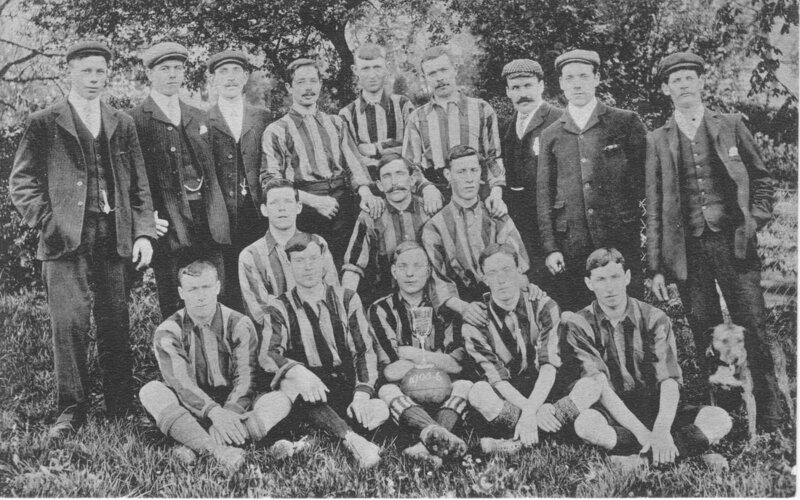 Prosser was a keen part of Box football sides in the years between 1905 and 1909, seated bottom left in these two photos, some of the earliest ever taken of Box Football Clubs. Prosser's life changed totally during the First World War. Before he was called up he married Lilian in April 1915 and the following year Prosser joined up as a sapper (engineer) in the Royal Engineers. He served in the army for four years between 1916 and 1920. By the time he returned home, the local quarry industry was in serious decline and Prosser was obliged to seek a different career with the railways. In the inter-war years he was a railway linesman (installing electrical power or telephone wiring). He later became a railway lengthsman, responsible for small sections of the railway in Bristol. Lilian became the family archivist, keeping all the letters, cards and photographs she received. It was a sentimental way of remembering her family and friends which comforted her for many years until her death aged 97. Their wills left their estates to Lilian's nieces, Lilian May Phelps, Phyllis Lilian Steel and my mother Marjorie May Lindzey. I am proud that she was part of my family ancestors. Left: Wartime photograph of Lilian and Prosser taken in case of a fatality. Lilian retained a sense of humour throughout their time together. Every Christmas she wrapped up and gave Prosser a tie - or, rather, THE tie because it was the same one every year, until one year she couldn't find it because Prosser had disposed of it, wanting something new. For such a family-loving woman she probably regretted that she and Prosser had no children and made clothes for her nephews and nieces every Whitsuntime. Lilian and Prosser were married for 56 years until Prosser's death in 1971. The photos below, taken of the elderly couple, seem to show a pair still very much in love after so many years. I hope that was so. James (18 March 1781 - June 1843) married Martha Prosser on 19 September 1803 at St Clement Church, Worcester. Children included James (1805 - 1864). Martha (b 1836); Benjamin (b 1840); Isabella (b 1849). William James (1860 - 1910); Arthur (1861 - 1943); Henry Prosser (Harry) (1863 - 1893); Charlotte Emma (1865 - 1939); Herbert Prosser (1872 - 1965). Henry James (1891 - 1891); Mabel Blanche (b 24 December 1892).